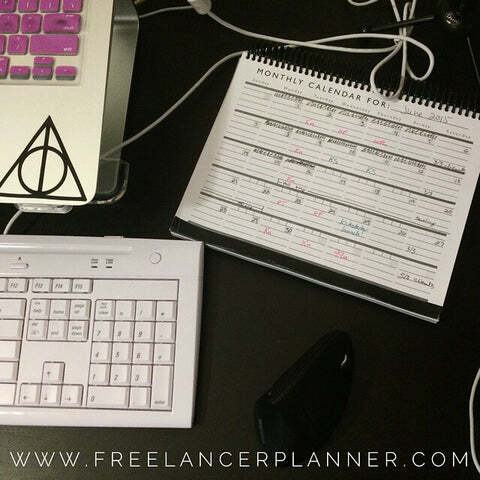 Last summer, I ran a Kickstarter campaign to fund a first print run of my Freelancer Planner. And it was successful: funded to 156%! It was easily one of the biggest projects of my career to date, and I’ve been planning on doing a breakdown blog post series for ages now. That day has finally come. First off, everyone tells you a Kickstarter is all consuming, and I’m here to say: that is the truth. And not just for the time you’re running the campaign, either. Expect it to eat a solid six months of your life, minimum, the way a naughty dog steals leftovers, without mercy or remorse. Does that sound dramatic? Probably, but it’s warranted – and this was a relatively small/simple campaign, all things considered. There is a reason that this recap is only just now showing up, over six months after the campaign was technically “over.” It’s because trying to market and fulfill a Kickstarter campaign on top of a full freelance workload (and editing a novel whenever I had a minute to breathe) didn’t leave a whole hell of a lot of spare time for anything else. This was my first time ever doing a physical product. Some of my mistakes were probably super-n00b mistakes, but I’m sharing them all anyways, so that others can learn from them. It’s also worth noting that my goal was fairly modest ($5,900) – some of what I did is probably not scalable for a project with a much larger goal or scope. Because of that “omg I need something to work on or I am going to lose my damn mind” urge, I just kinda jumped in with both feet – if I had taken another 30-90 days to dig into my PR strategy and do more research, I’m fairly confident I could have raised another couple thousand dollars, at least. But you live and you learn. I’ll get super granular on how each of these saved my bacon, in turn. But overall, if you’re looking at doing your own Kickstarter (or launching any kind of concentrated marketing campaign), I’d check these out. I did a 35 day campaign, based on research I’d done that indicated 30-40 days was the ideal length for a campaign. Any shorter and you risk running out of time before getting funded, any longer and you risk losing momentum. That makes sense, since I had to keep actively marketing it every.single.day or backer levels would drop off – it was already exhausting, but it’d be near-impossible to keep up over a 60 or 90 day campaign. As you can see, social media and content marketing/guest posting drove quite a bit of backer support during the campaign – I’ll get into the details of what I did there in future posts. All told, I thought I had trimmed down the tiers a fair amount when I launched, but I could have cut another few (see above – the $1 and $115 tiers would be easy eliminations). So that’s what the overall outcome was – but what, exactly, did I do? At least one a week for the next few weeks. Keep checking back (or sign up below) to get all the details!